You can turn a bland entryway into a bright, visual experience by utilizing a series of backlit display panels. 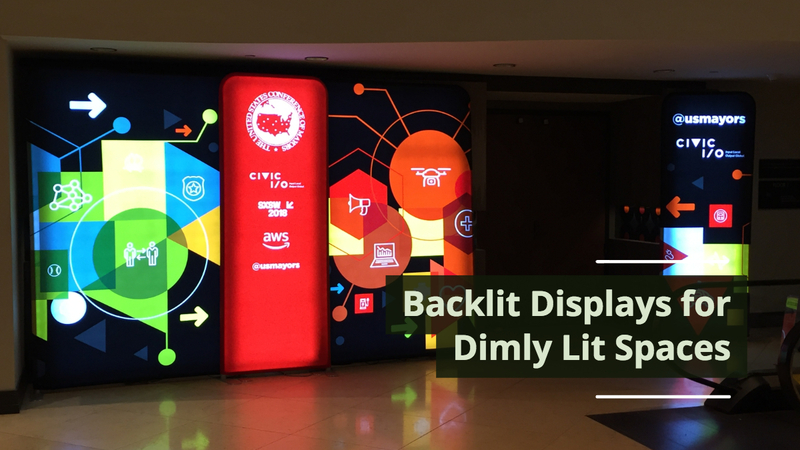 Whether it's a dark corner in a hotel lobby, college atrium, event space, or at the bottom of a stairwell, properly designing and employing backlit panels can reinvigorate any space with a punch of light and color. Backlit panels can also enliven your booth space during a preview reception where the lighting is set for mood or at events with performances. The United States Conference of Mayors employed a series of backlit display panels to brighten the entryway in a dimly lit hotel conference room entryway during SXSW in Austin, TX in March 2018. The lighting created an enticing entryway out of a drab entrance. The beautiful design was amplified by the reflection off of the floor and draws the eye towards the visual creative. The panels doubled as a backdrop for some of the video interviews scheduled to promote the event. As in the design in the above panels, it's recommended to use light colors sparingly for the best effect possible. Too much white makes the visual too washed out. By including a strong black component in the design, it allows the variety of colors to pop from the visual and draw the eye throughout the space. Regardless of the final application, backlit displays provide an inventive way to grab attention and draw attendees in for a closer look.